I'm going to discuss two schools here, post-secondary schools. Intense, professional training schools. Radically different schools. These two schools both had incredibly high standards, both had very demanding professions, both needed to train an amazingly level of personal responsibility because doing either profession irresponsibly created a real risk to the lives of others. Both also had no interest in fostering traditional academic competition among students. They did things very differently. At the Police Academy we all wore uniforms. At Pratt we wore anything and on occasion nothing. At the Police Academy punctuality was a big issue. At Pratt, ummm, not really. At the Police Academy we called instructors "Sir." At Pratt we called them whatever we wanted to. At the Police Academy we had a rigid exam schedule. At Pratt, the one time I remember an exam being given, a friend of mine locked the prof out of the room and we did it together. And, counterintuitively, at the Police Academy we went to school is a beautiful Manhattan neighborhood, on a block shared with the School of Visual Arts. At Pratt we lived in a despairing neighborhood that would later be immortalized by Spike Lee in his film, Do The Right Thing. Perhaps most dramatically, at the Police Academy we were constantly aware of our grades, while at Pratt's School of Architecture we had none. Yet, I will argue here, that both had excellent assessment systems. But that's just part of the story. Both excelled by being radically different than most US post-secondary institutions. Both really worked to bring out the best in diverse people. Both utilized surprising faculties, which were highly effective. Both combined comraderie and very high expectations, in a way which created communities of learners. 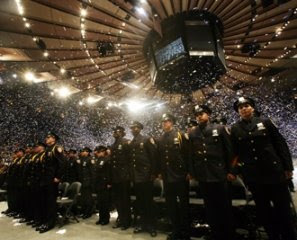 The New York City Police Academy is an unusual program in this field. It is worth a ton of SUNY credits, all earned in six months, including three hours of law, five days a week, for those six months, half of it Constitutional Law (yes, I know it does not seem like that from, say, actions during the Republican National Convention in 2004, or during Critical Mass bike rides, but NYPD cops have every reason to be a lot closer than most to being 'constitutional scholars'). There is a lot of psychology and sociology, and diversity training, in addition to what you'd expect - procedures, physical fitness, weapons training, self-defense, etc. That's a wildly demanding academic program for a very diverse group of students, and yet, almost every incoming cadet graduates. It is a stunningly successful operation. Why? First, think, "whatever help you needed" was always there. I needed books on tape, and they instantly provided me cassettes which, dumped into an early generation Walkman, read me to the Academy on the subway every morning and back every night, read me through lunches, and read me to sleep every night. If you needed tutoring, you got it, from peers or faculty, you just had to ask. I know I ran remedial swimming sessions and second, third, and fourth chance CPR certification testing - the stuff I was good at. If you failed something the first time, you got a chance - or two - to do it over. Most people there had never studied law before, or used a gun, some had really never driven before. Which is second, they seemed to understand that we might not all learn all of this at the same rate. Third, no one seemed 'ahead at the start.' One of my good friends at the Academy had a father who was the Chief of Bronx Detectives. This meant nothing in terms of how he was treated. Others came with significant knowledge, they might have worked for the department in 'civilian' capacities. That made no difference either. It was not just the sameness of the uniforms, it was a sense that we all had a way to go. But fourth, and maybe most importantly, it was a community of learners. I did extremely well there - I finished second in my class (why didn't I finish first? funny story) - but that was never a focus of anything. The guy who barely passed the exams had no less status. He was a really good friend too. Our goal, company by company of cadets, was to make sure everyone succeeded. Competition did not exist. None of this is to imply that standards were ever lowered. They weren't. But different things had different standards. You could pass most exams with a 75% mark. Except for one, on the use of deadly physical force. Passing for that was 100%, as it damn well should be. "How can you have an engineering course without grades?" an anxious parent asked at a School of Architecture information night. He was addressing the question to Y.S. Lee, who taught the steel structures and concrete structures courses, and not an engineer to mess with - among his works, the Gateway Arch in St. Louis and Madison Square Garden in New York. "It is simple," Lee responded. "No one leaves my class knowing 95% of what makes a building stand up." There were no grades in design studios either, how, exactly, do you grade a design? 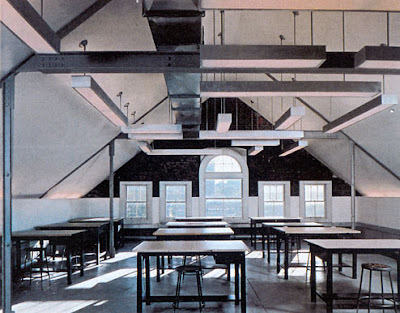 Yes, Pratt's Architecture School now has grades, but it didn't then. Everything was pass/fail and that worked, one way or another, for all courses. There was also a lovely flexibility. On the first day of a landscape design course I decided that I could not handle the mix of students, professor, and room. And I never came back. But I had the syllabus, and I worked with the course information, and I did the final project. I did it big, and left it in the professor's mailbox. My evaluation said, "I have no idea who this student is as he never came to class, but he did hand in a magnificent design as his final project which clearly indicates that he has mastered the content of this course. Pass." Thank you. And in a Concrete Materials course, fed up with books, we, as a class, decided instead to build a pre-cast concrete structure. We designed panels which could be used vertically (for walls) or horizontally (floors/roofs), designed connector systems, created forms in a basement storeroom, where we tried and rejected a number of reinforcing schemes before settling on one which provided sufficient strength. We scaled the 8'x24' panel design down to 1/3 size, and went to work, casting about 48 of these things. Then we carried the panels out to a sunny campus lawn, and assembled a gigantic structure. Believe me - I know concrete. And as I watch a classmate spec a massive concrete building in New York, I know he does as well. And in design studios we went wherever we wanted. I tended to craft either Prairie designs based on the work of Marion Mahony or Beaux Arts work, which I illustrated with vast drawings in which the building was inevitably presented against a storm sky. People admired the contextualist approach and the craftsmanship even if they knew I was making myself unemployable. Others were modernists, still others post-modernist followers of architects like Robert Venturi. Didn't matter. We all sat and drew and argued together, and pulled inspiration from each others work. The other component was that almost all "instruction" was via projects. You worked on buildings which taught you skills. You didn't learn skills, and then work on buildings. In professional training the relevance is easy. And these schools kept learners engaged through relevant experiences. But, the key things, the comraderie, that creation of the learning community, was every bit as strong at Pratt as it was at the NYCPA. And that is what ultimately brings these stories together. Both gave students what they needed. Both treated students equitably, not equally, and both developed intelligent assessment structures designed to support, rather than rank. Thanks - these are great examples, and I plan on passing them along to my K-12 cohorts. An ed specialist faced with a roomful of Behaviourally Impaired (gotta have labels!) middle-schoolers is proposing to teach them as a project-learning team, and these examples will help - I'm helping with collab tech. Can I share a story? I arrived at Loyola (Los Angeles) in 1970, when they were experimenting with Individualized Study. I was 16 and wanted to talk with dolphins for a living. They gave me the Chemistry Nun, who drove me to UCLA every day, where she was working on her PhD. UCLA BioMed Library was open stack, which meant 7 or 8 floors with low ceilings, connected by iron staircases. Each floor was stuffed with journals and books, and you could wander at will. It was a 3-dimensional internet. On the drive to and from, I would talk with the Chemistry Nun about how science got done. Best educational experience of my life. I really like the contrasts of the two systems and yet how they focus on the learners and engaging them in meaningful experiences. This to me is essentially what Dewey was about yet this has never taken hold in the education world. Too much work; too few true teachers/mentors in our field working together with this type of vision. What Teacher Education needs to be?